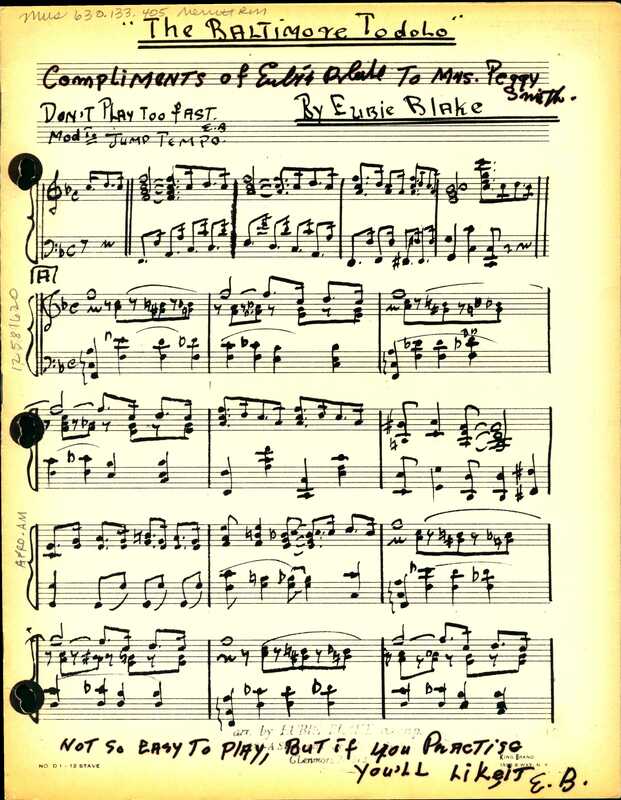 The Loeb Music Library holds several artifacts relating to the American pianist and composer Eubie Blake, born February 7th, 1887 in Baltimore. 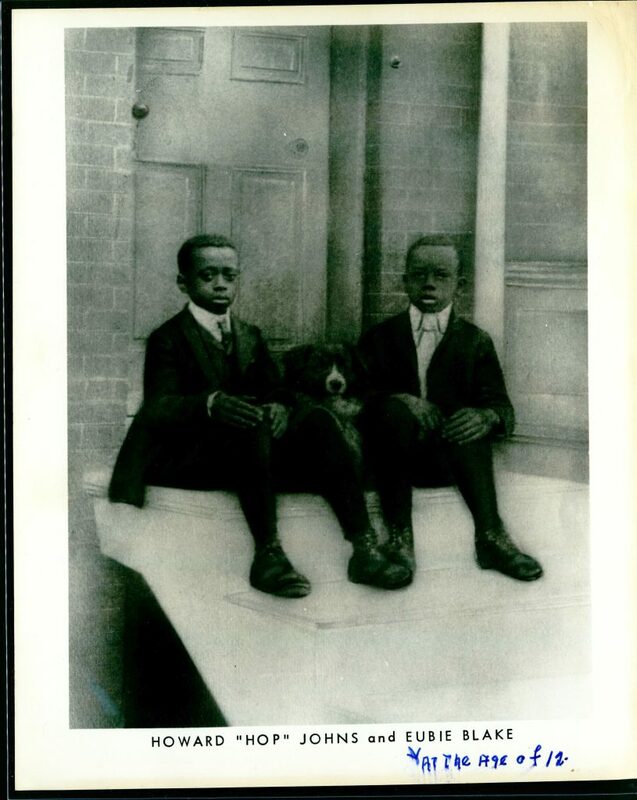 In this portrait of Blake as a child, he poses on the steps of a Baltimore home with his friend Howard “Hop” Jones and a dog. The original photograph, by an unidentified artist, is thought to have been made in approximately 1899. The Music Library’s gelatin silver print reproduction dates from the 1970s. We have three unusual dyeline reproductions of Blake’s manuscript scores: a ragtime piece for piano entitled Baltimore Todolo, as well as two songs from Chocolate Dandies, Blake’s moderately successful 1924 production with lyricist Noble Sissles (an earlier Sissles and Blake enterprise, Shuffle Along, was a hit and launched the careers of many significant black performers, including Paul Robeson and Josephine Baker). Smith and her husband, William, were fans who became devoted correspondents of Blake’s. Blake’s letters to the Smiths, along with Blake memorabilia the couple collected such as newspaper clippings and concert programs, make up the small and unique collection Eubie Blake Papers. 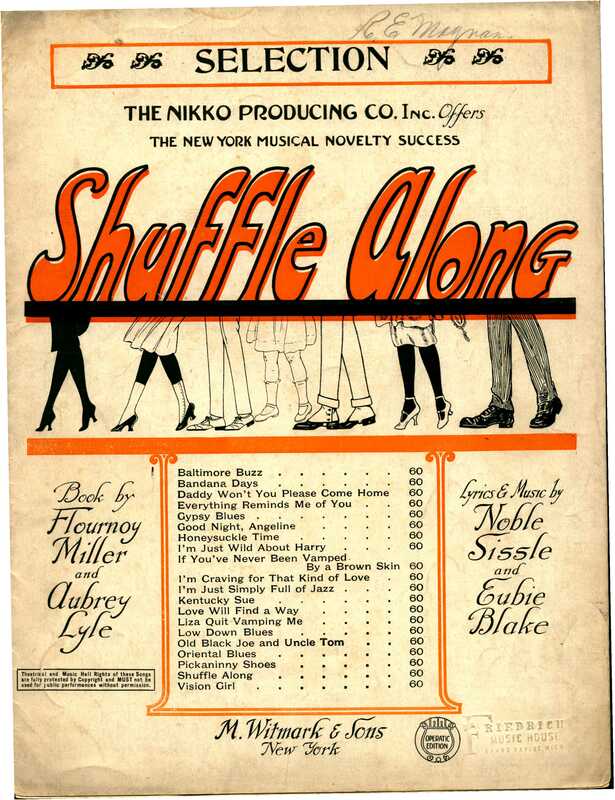 Some letters from Blake’s lifelong collaborator, Shuffle Along leading man Ivan Harold Browning, are also found in this collection, as are first-edition scores, but mainly the papers are a warm and newsy correspondence between Blake and these fortunate fans. 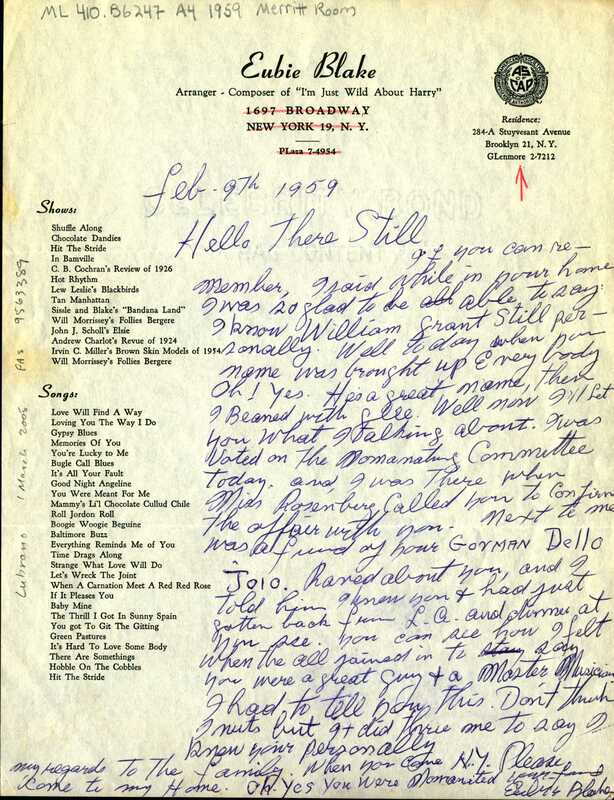 One last extraordinary Eubie Blake item in our library is this one-page note to the composer and arranger William Grant Still. Isham Memorial Library is the special collections unit within the Loeb Music Library. Many of its materials are in open stacks, with rare and unique items held in the locked Merritt Room. To view Merritt Room materials, simply click View Onsite in the HOLLIS record and follow the prompts to tell us you’d like to come, and what time suits you. As Isham is not always fully staffed it is advisable to wait for a confirmation message from a staff member before you plan your visit. 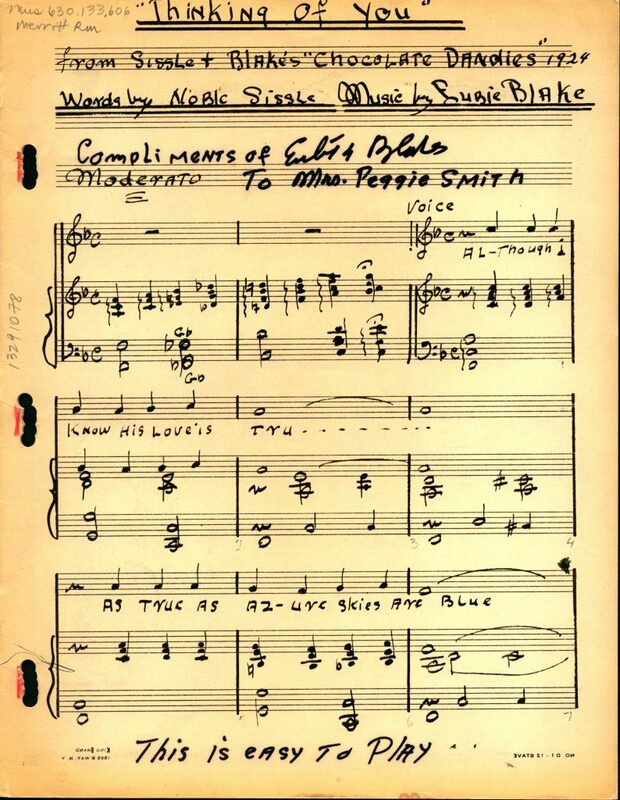 Among the collections of the Isham Memorial Library, a special library adjunct to the Eda Kuhn Loeb Music Library, may be found Ms. Coll. 131, a huge file of lively correspondence between Richard Aldrich, chief music critic of the New York Times from 1902 to 1923, and his friends, editors and fellow critics. Aldrich graduated from Harvard University and his personal library, donated posthumously by his son in 1955, was an important early gift to the Loeb Music Library. 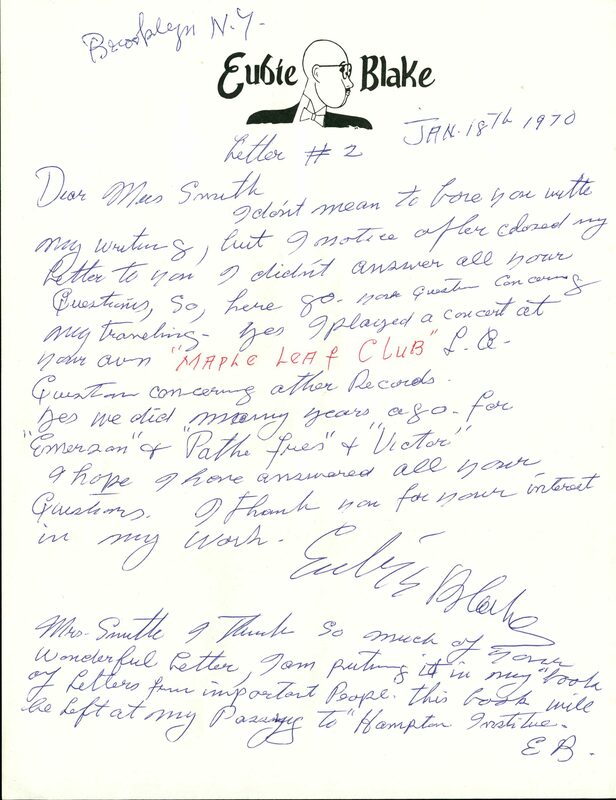 One particularly thick folder is that of letters to Aldrich from the folk music collector and editor Cecil Sharp. The correspondence chiefly concerned Sharp’s desire to investigate traditional English music as it was performed in the United States and Canada. Sharp’s research would result in the two-volume work English Folk-Songs from the Southern Appalachians (1932). Grove music online credits Sharp with giving “impetus to American efforts, subsequently taken up by American universities, to collect and publish their traditional ballads and songs, both English and indigenous, and to conserve their other traditional arts” (but see also The Imagined Village: Culture, Ideology, and the English Folk Revival, by Georgina Boyes, for a more nuanced interpretation). In these letters we see Sharp tentatively exploring his relationship to the United States and its traditional music.